Today is the Memorial of Our Lady of the Rosary and the Feast of the Most Holy Rosary! In fact, the whole month of October is dedicated to the Most Holy Rosary! We have been making a point to say the rosary together as a family each night (it had been hard to do when hubby was gone!). Later today we will also be meeting a couple other families at the park (unless the weather stays yucky... then they'll come here), to Pray the Rosary, color Charlotte's beautiful Our Lady of the Rosary Coloring Page, and eat our Cupcake Rosary! 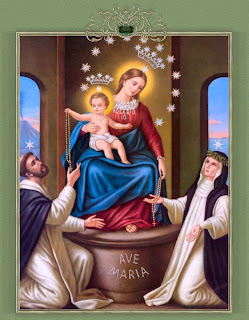 Queen of the Most Holy Rosary ~ Pray for us! Happy Feast of the Most Holy Rosary! I just wanted to let you know that I enjoy reading your blog (I learn so much here!) and that I've presented you with a little award over at my place.